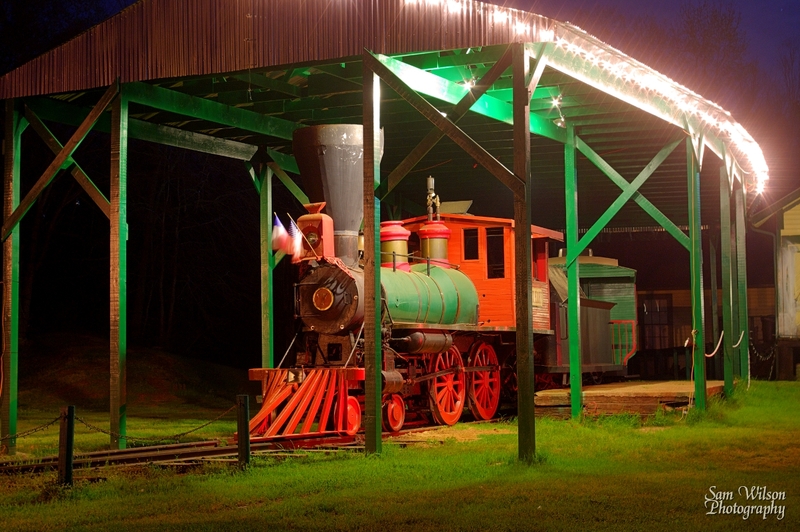 The Historic Jefferson Railway is offering a special Friday the 13th Ghost Train at 9:00 pm. Keep a wary eye toward the cypress-filled woods and swamps. You never know what lurks in the shadows. Something sinister is hiding there. You know something is going to reach out and touch you — you just don’t know where or when. You’ll be spooked by more than ghosts! Bigfoot (also known in these parts as the Boggy Creek monster) has been sighted running along the railroad tracks as the sun begins to set. Is the tale of the Bigfoot sightings fact or fiction? The Texas Bigfoot Research Conservancy website says “Jerry Hestand, Mark Porter and Charles DeVore investigated a number of cases in Marion County from reliable trustworthy people in or near these remote bottomlands. It is their assessment that it seems highly likely that events have been reported accurately”. The train rolls right by the home of the Boggy Creek monster as depicted in the upcoming horror movie, “Boggy Creek”, filmed in Jefferson and Uncertain. The movie is loosely based on the old Big Foot or Sasquatch legends, says Brian T. Jaynes, director and producer. So, are the sightings real or a spoof to enhance your rider experience? You’ll have to ride the train to find out! The Historic Jefferson Railway recreates the Golden Era of Steam railroading with narrated day trains on Saturday at 2:30 and 4:30. Steam hissing, whistle blowing and pistons chuggin, Old Engine #7 will take you on a scenic trip along the Big Cypress Bayou. As you roll through the history laden Piney Woods, you’ll view a Confederate Powder Magazine and traverse the site of one of the oldest, historical towns in Texas. Start Friday and Saturday evenings at 8:00 with free Fireside Ghost Stories at the historic “haunted” train depot. The story-teller will keep you at the edge of your seat as you hear stories about famous and not-so-famous Ghosts of Jefferson and Northeast Texas. Then climb aboard the legendary Ghost Train at 9:00. The Ghost Train carries you deep into the dark woods along the Bayou. The narrator shares legends of Jefferson and East Texas ghosts and a story or two that will make you reach for your loved ones! Historic Jefferson Railway was nominated as one of the Best Excursion Railroad Theme Trains for its Ghost Train by the readers of Cowcatcher magazine for the First Annual 2009 Gold Rail Awards. The Railway is a part of the thriving community of Jefferson sponsoring major events throughout the year that bring over 20,000 visitors to Jefferson. Riders look forward all year to Terror on the Bayou Fright Train, Rail of Lights Christmas & New Year’s Train as well as Diamond Don’s Riverport National Vintage Motocross and Trammel’s Trace Rendezvous. The train was built in 1964 for Six Guns Territory in Florida and moved to Jefferson in 1986. It is a Crown Metals reproduction of the 1870’s American class 4-4-0 steam locomotive christened the Robert E. Lee. The open car coach seats still carry the custom medallions cast into them designed especially for the Six Guns amusement park. Historic Jefferson Railway is located at 400 E. Austin in Downtown Jefferson, Texas. For information on pricing, schedule and events, please visit www.JeffersonRailway.com or call 866-398-2038. Come join us for Fireside Ghost Stories at the depot. This entry was posted on Tuesday, May 10th, 2011 at 1:11 pm and is filed under Ghost Tours, Historic Jefferson Railway, Jefferson Texas, Runaway Fright Train, Terror on the Bayou, The Ghost Train. You can follow any responses to this entry through the RSS 2.0 feed. Responses are currently closed, but you can trackback from your own site.